The door from the custody area opened and a small, thin, shaven headed man stepped into the vast hall of the Criminal Courts of Justice to be warmly greeted by his family. It was 15 March 2016. David Drumm, the man who once called the shots in Anglo Irish Bank, was about to step outside and face the media. He had been flown back from Boston the previous morning. Gardaí, who had accompanied him from the US, strenuously objected to bail, but it was granted with strict conditions. Drumm's parents in law, Danny and Georgina Farrell, were in court and acted as his sureties. 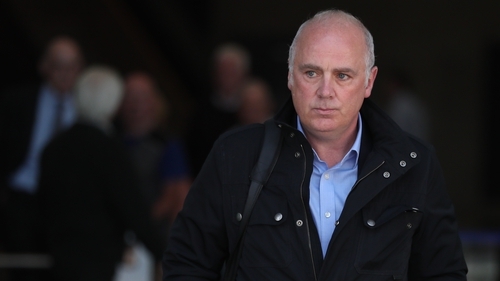 They were warned that if Mr Drumm did not turn up for his trial, they would lose €100,000. Drumm left Ireland in 2009, as the economic crisis worsened and the investigations into Anglo continued. He travelled to the United States before he could be charged with any offence and had not come back to be questioned. Now a huge media scrum waited, to capture the first pictures of the former high flyer leaving the Irish criminal courts. In a courtroom on the top floor of the criminal courts building, four other bankers were on trial for offences carried out in the dying days of Anglo Irish Bank. They included two of Mr Drumm's closest colleagues as well as his counterpart in Irish Life and Permanent, Denis Casey. One of the four, former Anglo treasury official, John Bowe, was making his way to lunch as Mr Drumm emerged from custody. He stopped at the glass balcony on the floor above, and turned around, straining to catch a glimpse. As Mr Bowe returned to his lunch, Mr Drumm stepped outside to be confronted with dozens of jostling and shouting camera people and photographers. He stood silently and allowed the media to take their pictures before gardaí cleared a path for him to get to a waiting car. The David Drumm who faced the cameras that March morning, appeared to be a changed man. He seemed chastened by five months in a maximum security prison outside Boston. He had tried to secure bail there but agreed to his extradition after his second bail attempt failed. The legal proceedings in the US had also attracted huge media attention. RTÉ's then Washington Correspondent, Caitriona Perry, described how during Mr Drumm's efforts to have himself declared bankrupt, the courthouse in Boston had set aside a special room for reporters to work in, such was the extent of the media interest. On one occasion, Mr Drumm along with his daughter wandered into this room to eat their lunch before realising they were sitting right in the middle of a large group of Irish reporters filing radio reports about him. Those proceedings ended in 2015, when the judge denied him bankruptcy and found Mr Drumm "not remotely credible" in his evidence about the transfer of hundreds of thousands of dollars worth of assets to his wife, Lorraine. During the subsequent extradition proceedings, Mr Drumm was acutely aware of the eyes of Irish journalists on him, as he was brought to court, cuffed and shackled. By the time he agreed to be extradited, he seemed to have little left to lose. But in the two years since he arrived back in Ireland, some normality returned to his life. He moved with his wife into a new house, in a development on the outskirts of his hometown of Skerries. And like many of the other defendants in Anglo-related trials, he tried to treat his frequent pre trial court appearances, and the many days of evidence, as if they were part of his job. The legal aid he had been granted, allowed him to be represented by a team of the very best defence lawyers in the State. Mr Drumm would stroll purposefully into court with his laptop bag, consult with his team, take notes and work frequently on his computer. Mr Drumm's demeanour in court was in general, cheerful and friendly. During preliminary hearings he sat near journalists, some of whom he had known in his previous life. Flashes of black humour would emerge as he joked with them. Even during the trial itself, his outward geniality rarely faltered. Only as the case reached its closing stages, did he become noticeably less chirpy and more apprehensive. As the jury deliberated, he would sit outside court 19, reading. But his sense of humour remained. Asked one afternoon, by this nosy journalist, what he was reading to keep himself occupied, he laughed ruefully as he showed me the title of his book: "America". There's no doubt, however, that his sense of humour, coupled with the arrogance he displayed as a top banker, contributed to his downfall. Those who listened to the now infamous "Anglo tapes", especially members of the media, would have recognised the pitch-black, gallows humour displayed by many of the participants. Mr Drumm and his colleagues were almost giddy and hysterical as the financial markets went into freefall around them. But while their panic may be understandable, their disdain for financial authorities and their sheer recklessness is difficult to listen to, knowing the catastrophic events that unfolded after the bank collapsed. To the ears of some, the bankers were simply trying to keep Anglo's doors open and were maintaining a sense of humour as they did so. To a majority, however, they seemed to have little regard for the long term consequences of their actions and had no qualms about allowing the hated authorities to bail them out when they knew they were about to go bust. David Drumm's lawyers were aware of the effect the tapes would have on the ordinary members of the public who made up the 14 member jury. In legal argument, they fought to keep the most damning excerpts out of evidence. They argued that Mr Drumm did not know he was being recorded. The tapes were just a snapshot of different conversations, and it would be unfair to pluck out these excerpts they argued. They also told the court the tapes were "a cultural phenomenon" and had gone around the globe. The prosecution argued the tapes were relevant, because they showed the relationship between the bankers and the regulatory authorities. The tapes were admitted into evidence, although some of the most prejudicial words and phrases were deleted before they were played to the jury. After some last minute splicing, the word c**t was removed from conversations. And journalists who had covered the previous trial of Mr Drumm's colleagues, were confused when the word "moolah" seemed to have vanished from a conversation they had previously reported on. The essence of the tapes remained however. The court heard David Drumm effectively giving orders in September 2008, in what the prosecution described as "a massive con". The bank had been frantically scrabbling around for funding since March 2008. A special funding committee had started off with more than 50 possible intiatives. By September, a deal with Irish Life and Permanent was the only option left. In telephone calls between John Bowe and Mr Drumm that month, played for the jury the two men discuss getting six billion euro from IL&P. Mr Drumm says to Mr Bowe that they can't get cash off "Freddie f**king fly down there - the Regulator - because it will appear on the balance sheet". He refers to the Central Bank and the financial regulator as "that f**king shower of clowns down in Dame Street". He tells Mr Bowe they have to make their best attempt to get the balance sheet looking in reasonable health. And he says they are under stress because Lehman's went bust "and other f**king non normal things happened". Mr Drumm says he'll be telling the Central Bank, Anglo needs a loan because they are running out of money and is going to keep asking them "the thick question - when's the cheque coming?" Very shortly after beginning their deliberations, the jurors asked to hear this particular conversation again. They also asked Judge Karen O'Connor if it would be possible to listen to the telephone calls in their own jury room without coming into court each time. This issue was never fully resolved, but the jurors never asked for any other recordings or to have other evidence repeated to them. The cause or a symptom? Much of the testimony in the 87-day trial concerned the minute details surrounding the series of transactions carried out in late September 2008. Anglo Irish Bank and Irish Life and Permanent had cooperated previously on schemes in March and June of 2008. In each case this was to make their half year figures look better. These previous transactions were described as "legitimate balance sheet management", because they involved real cash or assets. But those at the centre of this case were not real - they were "monumentally fraudulent". There was a hole in Anglo's accounts, and David Drumm decided to fill it "by hook or by crook", prosecuting counsel, Mary Rose Gearty told the jurors. The same sum of money was sent out of Anglo and sent back in again a number of times "at lightning speed". The only real money involved was £1 billion in sterling sourced from Anglo Isle of Man. It was sent from Anglo to Irish Life and Permanent and then back into Anglo via Irish Life Assurance. Each time the same amount of money came back in, it was counted as if it were a new deposit until it "totalled" €7.2 billion. It appeared in Anglo's preliminary end of year accounts as a customer deposit. And no link was made between this "deposit" and €7.2 billion in interbank loans. The intention was to deceive people - to make them think corporate customers still had faith in Anglo Irish Bank. By the time the figures were published in December 2008, however, the writing was on the wall for Anglo and the strength or weakness of its corporate deposits was becoming irrelevant. "The dance" was over and the bank was nationalised the following month. This was a point made by RTÉ's Economics Editor Sean Whelan, on the night of Mr Drumm's conviction. The charges in this case sprang from the collapse of Anglo and the deepening economic crisis but the September 2008 transactions did not cause the crisis - they were a symptom of it. Ireland does not have an offence of reckless lending. Even though Anglo was described as behaving "like a building society on crack" before the boom imploded, the crazed lending it, and other institutions, indulged in could not be punished by law. Instead, over the course of lengthy investigations, beginning in early 2009, bankers were questioned and eventually charged with company law and conspiracy offences. Some of the company law offences, although on the statute books for decades, had never been tried in court before. And some of the investigations were more successful than others. The Office of the Director of Corporate Enforcement's probe into allegations that the former Chairman of Anglo, Sean FitzPatrick, had misled the bank's auditors, ended in disaster for the authorities and acquittal for Mr FitzPatrick. Part of the problem with that investigation stemmed from an inexperienced civilian investigator coaching witnesses and drafting statements, trying to make the evidence "fit" the specific charges. The Garda National Economic Crime Bureau faced significant challenges with this case. Witnesses interviewed insisted on having their solicitors present. The logistics of fitting interviews in business hours around garda shift patterns presented some problems. Hundreds of thousands of electronic documents had to be analysed and tens of thousands of phone calls listened to, as questions started to be raised elsewhere about the length of time the Anglo investigations were taking. Claims of legal privilege over certain documents had to be dealt with and before the trial took place, a huge disclosure process was entered into as thousands of email communications and contacts with witnesses had to be disclosed. But the painstaking investigation by gardaí and the methodical work of the DPP's prosecution team, finally yielded results and it's hoped, will provide valuable lessons for future cases. On the steps of the criminal courts, Superintendent Gerard Walsh, flanked by his investigators led by Detective Sergeant Michael McKenna, expressed the hope that the verdict would emphasise the importance of corporate responsibility at all levels, and "the very real obligation to conduct business with honesty and integrity at all times". The gardaí and the legal system now have a greater depth of expertise to call on when those high standards of corporate responsibility inevitably slip again. Four senior bankers have now been convicted in relation to these charges. John Bowe has completed his two-year sentence. IL&P's former group Chief Executive, Denis Casey was sentenced to two years and nine months and is expected to fully complete his sentence in August. Willie McAteer, Anglo's director of finance was given a three-and-a-half-year sentence which is expected to finish next year. Both men are however, on temporary release, with Mr McAteer having to report weekly to Limerick Prison. David Drumm was the most senior person on Anglo's side of the conspiracy, and was described as the "driving force" behind it. The maximum sentence for the offence of false accounting is ten years. There is no maximum for conspiracy to defraud although the court would be expected to seek guidance from previous cases. The sentence hearing will take place on 20 June. The court will hear a summary of the evidence followed by pleas of mitigation by Mr Drumm's legal team. Judge O'Connor will take into account the five months spent by Mr Drumm in custody in the US while awaiting his extradition. She may be asked to give special consideration to the difficulties Mr Drumm endured while under the harsh US prison regime. In the meantime, after his lawyers appealed to the judge on "humanitarian" grounds, Mr Drumm has been granted bail and must sign on daily at Balbriggan garda station. Although the public and media interest in the fall out from the collapse of Anglo Irish bank has waned in the ten years since the economic collapse, he is still under scrutiny. Photographers have been waiting for him outside the garda station as he signs on. And social media commentary has been vitriolic and unforgiving. For some, whatever sentence is imposed by Judge O'Connor will never be severe enough. But no matter what happens in a fortnight's time, Mr Drumm's case will go down in history: one of the few bank bosses in the western world to go to jail as a result of the global financial meltdown.